These small, simple tours are an alternative to more elaborate bus tours. They are usually free or only the cost of admission to a site, no bus fees, usually unless otherwise noted there are no reservations. People, SCHS members and public alike, are invited to just meet at the site unless reservations are specified. The idea is that many of us desire to see historic sites in our area, but tend to not get around to going. So together we set a destination, a date and time for the tour, announce it and then just do it. The tours generally are set for the week after the SCHS general meetings, which are held quarterly in January, April, July and October on the fourth Wednesday of the month. See the Events page for upcoming or past SCHS Meet-at-the-Site tours. Select the page for the current year or a year in the past. Past tours are also listed below. Come as you are, member or non, to join us for a fun, friendly, simple SCHS Meet-at-the-Site Tour! 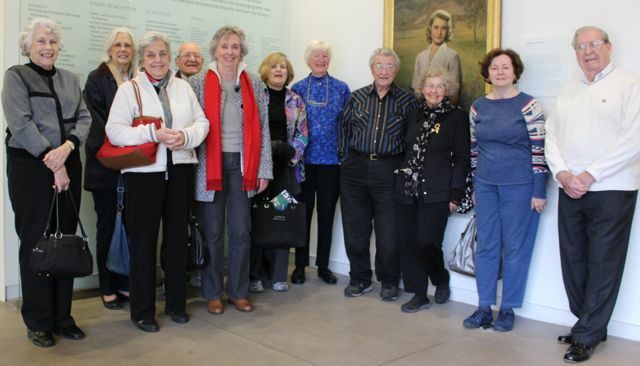 The Winter 2016 SCHS Meet-at-the-Site Tour went to the Kemper Art Museum at Washington University to see the exhibit of Winston Churchill paintings Wednesday, February 3, 2016, at 11:00 am. February 11, 2015, Wednesday. – Please note that this event is over. Meet-at-the-Site Tour to Cathedral Basilica of St. Louis ( The New Cathedral ). April 29, 2015, Wednesday, 10:00 am – Please note that this event is over. 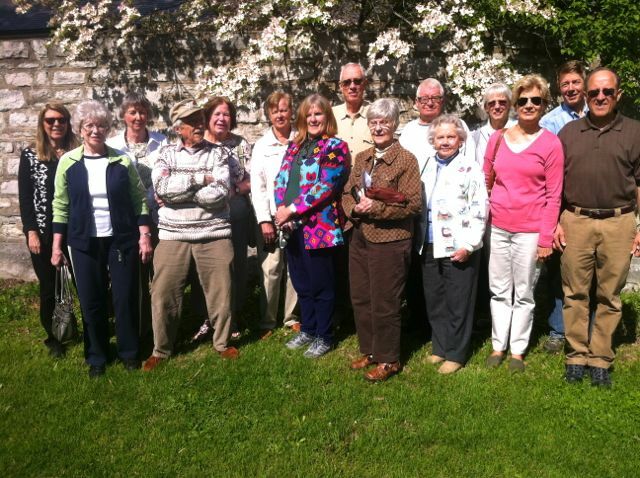 SCHS members attending the April 2015 Meet-at-the-Site Tour to Jefferson Barracks Historic Site. July 29, 2015 Wednesday, 10:00 am – Please note that this event is over. 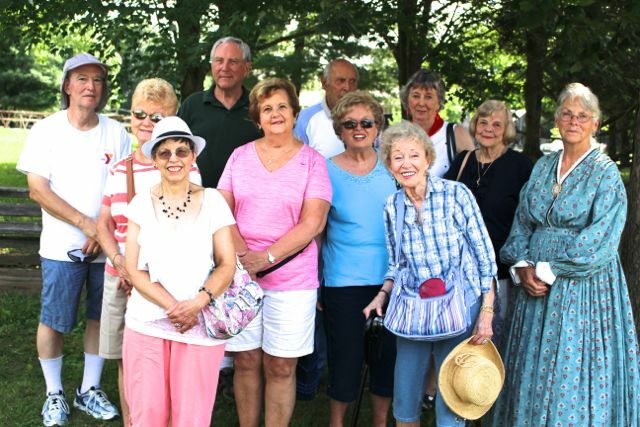 Summer Meet-at-the-Site tour – Faust Park Historic Village. September 9, 2015 Wednesday – Please note that this event is over. September 19, 2015 Saturday. Yes, that really is S-a-t-u-r-d-a-y, different from the usual Wednesday tours. – Please note that this event is over. Most of the group that attended the September SCHS Meet-at-the-site Tour to Missouri History Museum to see “A Walk in 1875 St Louis. See more photos on page, Hold that pose St Louis! January 29 (Wednesday), 2014 at 10:00 pm – Please note that this event is over. This Meet-at-the-Site Tour is Wednesday, January 29, at 10 a.m. at the recently opened Missouri Civil War Museum, located in the old 1905 Officer’s Post Exchange Building, 222 Worth Road in historic Jefferson Barracks. The three-story building that had sat in disrepair for decades was completely restored to a beautiful structure for the “preservation and study of Missouri and its involvement in the American Civil War.” Custom-made display cases house numerous artifacts — muskets, uniforms, medical equipment. In the center of the main room a cannon, supply wagon and a life-like horse are part of a military scene. Admission: adult $7; senior (age 65 and over) $6. If there are more than 10 in our group, the admission price will be discounted to $5 per person. Lunch at local restaurant follows for those who want to join in. Car pool at St Lucas UCC, meets at 9:15 am. See more about the Missouri Civil War Museum. A few of the attendees at the SCHS Meet-at-the-Site tour to Missouri Civil War Museum. April 30 (Wednesday), 2014 at 10:00 am – Please note that this event is over. at Missouri History Museum to see the free exhibit, “250 in 250” which celebrates the 250th anniversary of the founding of St. Louis. 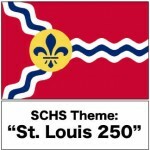 St. Louis turns 250 in 2014! How do you tell 250 years of St. Louis history in one exhibit? The Missouri History Museum does it through the stories of 50 People, 50 Places, 50 Moments, 50 Images, and 50 Objects. We can’t give you a complete picture of St. Louis’ 250 years of history, but through these 250 snapshots, we will give you an engaging look at the richness, diversity, and complexity of the place you call home. 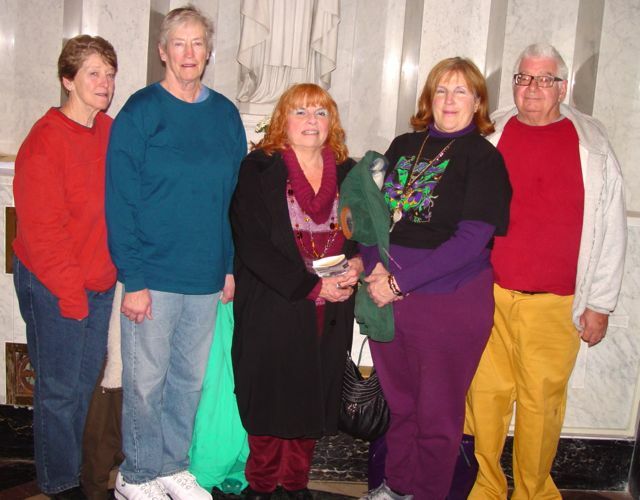 Meet at the Missouri History Museum at 10:00 am at the statue of Thomas Jefferson or car pool from St Lucas UCC. The car pool meets at St. Lucas at 9:15 am on the east parking lot (far north end). There will be a sign-up sheet at the April 23 general membership meeting, or call Stephen Hanpeter at (314) 918 -1617. July 30 (Wednesday), 2014 – Please note that this event is over. 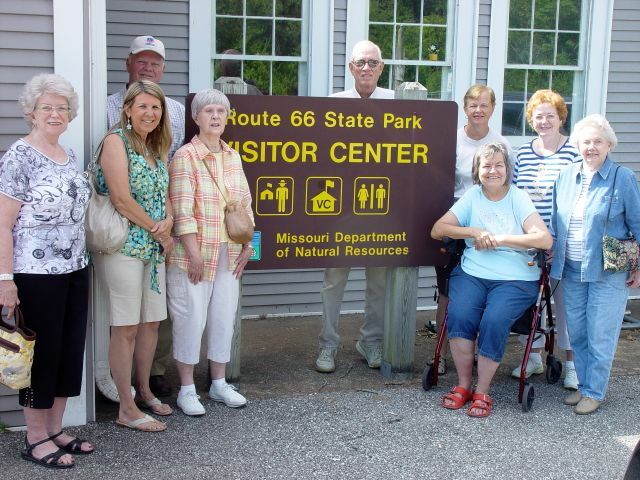 Meet at the Route 66 State Park Visitors Center, a museum of Route 66 memorabilia in 1930’s era road house, at 10:00 am, or for car pool from St Lucas UCC meeting at 9:15 am, leaving at 9:30 am. Car pool will meet on the east parking lot at St Lucas at the far end (north) of the lot. Admission to the Visitors Center is free. Please sign up for the tour at the July 23 SCHS general meeting or call Stephen Hanpeter – 314-918-1617. Driving directions: Go west on Highway 44. Get off at exit 266, called Lewis Road. Follow the signs for the Route 66 State Park. The signs take you to the end of the road where the visitor’s center is. Meet in the lobby at 10:00 am. See more info and photos on Route 66 State Park tour page. October 29, (Wednesday), 2014 – Please note that this event is over. Meet at the Mercantile at 10:00 am, or for car pool from St Lucas UCC leaving at 9:15 am. Car pool will meet on the east parking lot at St Lucas at the far end (north) of the lot. Get directions to St Lucas UCC church. See special exhibit, “Mapping St. Louis history: An Exhibition of Historic Maps, Rare Books and Images Commemorating the 250th Anniversary of the Found of St. Louis.” Join us as we continue honoring the city’s 250th anniversary with the special exhibition Mapping St. Louis History. Visitors will be able to watch the city develop and expand through maps that are not only important documentary objects but things of beauty as well. Each map will be complemented by a contemporaneous print, painting or photograph and rare printed histories that complete the telling of St. Louis’ story. Get directions to St Lucas UCC church. See photos to help find your way to the library. Mercantiel Library copy of the fabulous Compton & Dry 1875 map of St Louis. Stephen Hanpeter with Mercantile Library Gateway to the West birthday cake. Attendees at the SCHS Meet-at-the-Site tour to the Mercantile Library. January 30, 2013, Wednesday at 10:00 am – Please note that this event is over. The week after the general meeting we will have a Meet-at-the-Site-Tour to Jefferson Barracks to visit the Powder Magazine Museum. We will be guided by Marc Kollbaum, our January general meeting speaker. Drive yourself and a friend or two to join us at Jefferson Barracks! Wednesday, May 1, 2013 – Please note that this event is over. Our Spring Meet-at-the-Site tour will be to Kimmswick to see the Anheuser House and collections. Situated on a beautiful site along the Mississippi River, this fine country estate will open just for us. We need a minimum of 15 people to get this tour. So be sure to sign up at the April 24th general meeting. That will be the last day to sign up and put down your $5 entrance fee. After the tour we will have lunch in Kimmswick at either the Blue Owl or the Dough Depot. For those who want to, we will gather again to go to the Kimmswick Historical Society Museum at 1:30 pm, which will open just for us. You can drive yourself to Kimmswick for the 10:00 am tour, or meet at St. Lucas UCC at 9:00 am to carpool together. Written driving directions will be available at the general meeting April 24 and at St. Lucas on May 1. July 31, 2013, Wednesday, 10:00 am – Please note that this event is over. Meet at the library downtown just inside the Atrium which is directly inside the Locust Street doors between 10:00 and 10:15 for guided tour, or carpool from St Lucas UCC. Carpool meets at 9:30 and leaves at 9:45 am. Sign up for the tour at the July 24 meeting or call Stephen Hanpeter at 314-918-1617 with questions. This is a free event. Reservations not required, just helpful. A few of the attendees at the SCHS Meet-at-the-Site tour to St. Louis Main Library. Taking the tour at the St. Louis Main Library. Meet at the Missouri Botanical Garden’s Tower Grove House. Admission is free to the public on Wednesday mornings, both to the garden and the house. Thursday, May 24, 2012 at 10:00 am – Please note that this event is over. The Sappington-Concord Historical Society sponsors a “meet-at-the-site” tour to White Haven, the Grant historic site. At our general meeting in April we heard about Ulysses S. Grant the family man. Come see with your own eyes Grant’s home and the interpretive museum and grounds. There is no sign up or reservations necessary. Just come at 10:00 am on Thursday morning, May 24. We will meet inside the entrance to the interpretive center in the entrance hall at 10:00 am. No reservations necessary. The tour is both indoors and outdoors so dress accordingly. The site is not large but it is a walking tour. Our last tour of White Haven was in 1995. Were you there? Things have changed in a big way since then! Wednesday August 1, 2012 at 10:00 am – Please note that this event is over. A “Meet-at-the-Site-Tour” We will meet at the site, the Sappington House, to tour the home of Thomas Sappington, the library and the barn restaurant-gift shop. Admission to the Sappington House is three dollars. Reservations are not necessary. 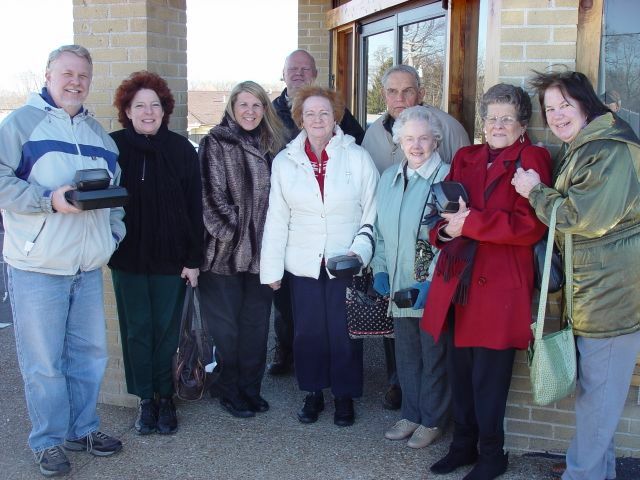 This tour is by special arrangement with the Sappington House and the City of Crestwood for Sappington-Concord Historical Society members and guests. Feel free to bring guests. If you have questions call Stephen Hanpeter at 314-918-1617. Wednesday, October 31, 2012 at 10:00 am – Please note that this event is over.